I started the quilting on my little table topper. I have decided to do outline quilting, which basically follows the shape of the seams. I think it's coming out ok. I'm trying to take my time and not be so spastic! I went to Amy's yesterday and it was a lot of fun as always! We stitched, shopped and ate (Pizza Hut, yum)! I stitched a little bit on my CHS Alphabet. 36 ct. Examplar, GAST (1 over 2). 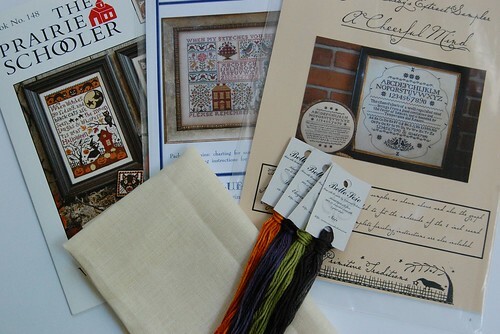 When I got home I decided to get out my CHS Sampler Stocking and work on it some. I would love to get it finished also. 40 ct. Meadow Rue, NPI Silk (1 over 2). I also got a little bit of stash while at Amy's. Prairie Schooler "When Witches go Riding," Blue Ribbon Designs "A Sampling in the Square," and Primitive Traditions "A Cheerful Mind." Here's my conversion if anyone is interested. I used Shepherd's Bush's model as a guide, but I have no idea what they actually used. Elegant Eggplant for 898 words. Well, that's all for now! I've got to get back to laundry, dishes and cleaning to get ready for the coming week. Write soon! Love the quilt, Nicole! I was actually talking to a quilting friend of mine yesterday who teaches at a LQS here. I'm thinking of taking a beginner class. Thanks for the link to the SB model. Jill did an a.maz.ing job on the frame & matting on that piece! Beautiful stitching Nicole! 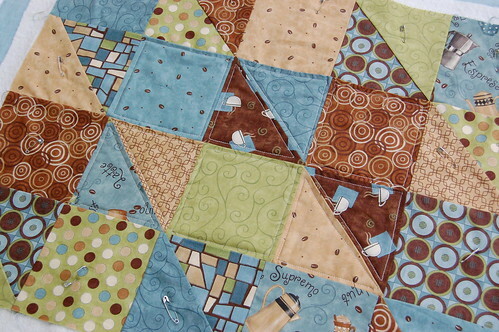 Great projects going and your quilt is lovely. Are you machine stitching the outlines? No matter, it's gorgeous either way! I do love the Shepherd's Bush conversion on the Halloween piece--wasn't that an awesome finish they had on that?! Looking forward to seeing your progress. Wow! So you're machine quilting using that machine from Walmart? I'm impressed! I love how it looks! I also love your WIPs. Gorgeous! And your stash -- I love stash! lol! It's the first time that I'm reading your blog, I'm French and let me tell you that I like and love it very much ! 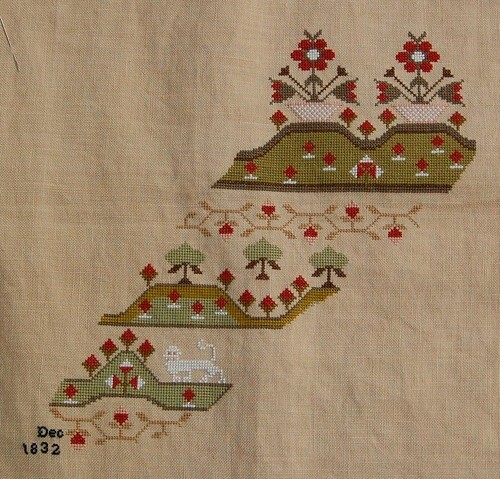 All you do is gorgeous, what a beautiful works, stitches and patchworks ! I really like the Prairie Schooler chart about Halloween. So, now, I'll come every day to read you and see your work ! Bonjour de France and friendly yours ! Your quilting is very pretty here. I am trying to get brave and learn to quilt, something basic to begin, but it intimidates me so much. Like your stash too, especially the Halloween one! I do "echo quilting" on pillows and other small projects since it's super easy and no fancy equipment needed. Yours looks great! Good job! I'm not a quilter either, but I sure love them! Oh, you're table topper is coming along very nicely!! You're doing a great job on it! Great stash too, love the color changes you made to Witches Go Riding! You're always such an inspiration! Your quilt is coming along wonderfully. I love your progress on your sampler stocking - such great colors. And good progress on the CHS Alphabets!! And all the stash is wonderful too. I like the conversion you're doing for the PS piece! Nicole, thanks for sharing your PS conversion. You are doing an amazing quilting job! Your quilt is looking really good! And you're well on stitching & stashing too! Everything is so pretty Nicole! Love the quilt and great stash. All your projects look great! I love your table topper, you are doing a great job with the quilting. Thanks for the conversion. Nicole, you have such an eye for color - your conversions are always great. I just love the colors of the quilt, just gorgeous!! Lovely stitching progress and great new stash! Have a great week! I look forward to seeing more of your progress. 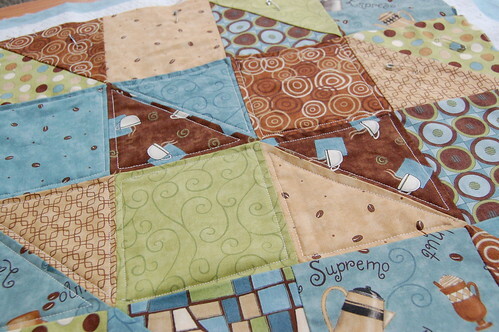 Love the Table topper quilt! And your stash haul look slike lots of fun! Nicole, I think you are a master at everything you do. Wow. 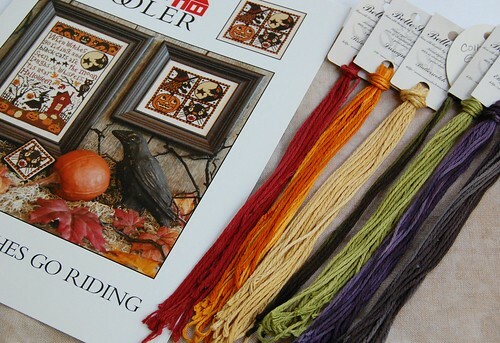 Color conversions, quilting, stitching, helping numbskulls with blogs. You name it, you can do it. ;) Wow. YGG! Everything looks great, as always! That quilt is a beauty, Nicole. I absolutely love the colors. I love the colors you chose for WGR, really pretty. Great stash haul too - that's always fun. wow, your quilt looks beautiful! I love the CHS alphabets and I have the charts somewhere - looking at yours made me want to look for them ;-) Pizza Hut is our favorite! Yum!